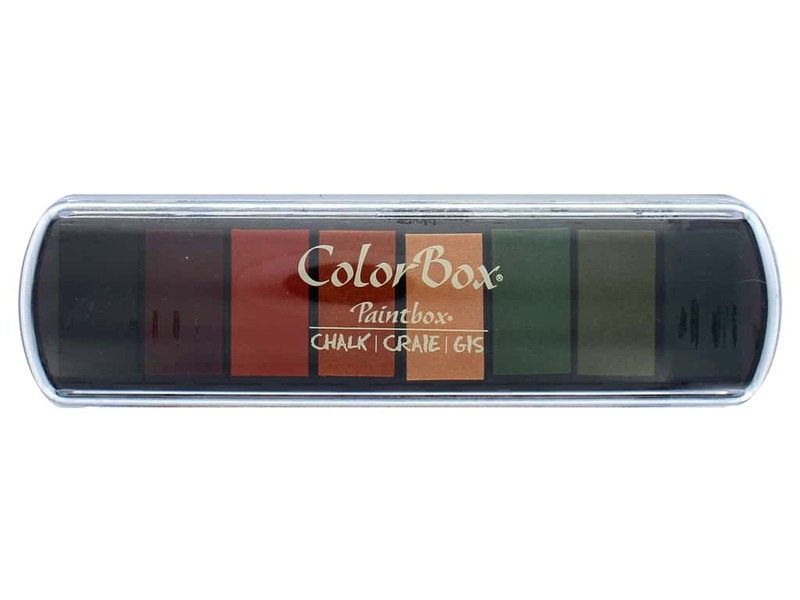 Description: ColorBox Chalk Inkpads give the dense, matte luster of chalk pastels in a fast drying, archival ink. Muted, chalk-like blendable colors may be buffed to a shiny finish. This ink lends itself to simple yet sophisticated techniques, while the "weight" of the ink lets you stamp lighter colors over darker. Fast drying, on most surfaces including paper, foil and clay, but requires heat setting to become permanent. Paintbox Cornucopia- 8 color pads, use together or remove one pad to use separately. Colors include Dark Brown, Red Barn, Pumpkin Spice, Harvest, Butter, Mint, Dark Moss, and Deep Green. Each of the small individual pads measures about .88"x 1.75". See more ColorBox Fluid Chalk Ink Pads.